Are you on the search for a comfortable new mattress in the wonderful state of Minnesota? The last thing purchasing a mattress should be is painful, and yet purchasing a mattress can be one of the most dreaded purchases. We understand that the pressure is on to purchase a quality mattress that will help you get optimal sleep at night. Sleep is essential- it is your foundation to success during your waking hours at work and the time in your day when your body makes the necessary repairs. We want to help you find a quality mattress that matches your sleeping patterns as well as your budget. Today mattresses come in all sizes and styles, and you can even find quality organic mattresses free from toxins for all ages- even infants! 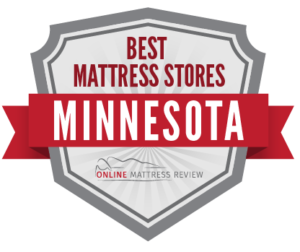 We examined the highest ranked mattress shops in some of the most populated areas of Minnesota, and selected mattress stores that offer quality products, reliable customer service, and convenient delivery and assemblage. As the mattress market has greatly expanded, you can expect to find quality mattress shops in places like Minneapolis, St. Paul, Duluth, and Rochester. Even somewhat smaller cities like St. Cloud , Marshall, Alexandria, Willmar, Bemidji and Fergus Falls will likely have a selection of mattress shops. Below we’ve listed what we consider the best mattress stores in Minnesota. If you need to know where to find a mattress in Minneapolis, we’ve got your back. We took a close look at some of the top-ranked mattress shops in Minneapolis and reviewed something for everyone: high end, budget-conscious, organic, mom-and-pop, and big box. Fortunately, regardless of your sleep patterns and your budget there are a number of great options for eac types of consumers. Out of all of the mattress stores, Mattress Firm covered the most ground. In particular we liked Mattress Firm Lyn-Lake (1001 W Lake St.). Mattress Firm Lyn-Lake offers all of the same quality brands of mattresses that you would hope to find at a big box store and also offers a quality shopping experience. The sales team are patient and knowledgeable and will never pressure you to spend outside of your budget. For first time shoppers here is a tip: have your price range in mind and take a little time doing some online “window” shopping before heading into the shop. Here, as in all Mattress Firm locations, you will be able to try out their variety of mattresses before making a final decision, and there’s always a 90-day trial period. So, if you notice a change, or the mattress was not quite what you hoped for, you can return your mattress within this 90 day window. A great organic mattress shop near Minneapolis is Naturepedic Organic Mattress Gallery located in Minnetonka (14200 Wayzata Blvd.). Here you will find toxin-free mattresses for all ages that are handcrafted and presented with love. You can even book an afterwork “happy hour” where you’ll try out the gallery mattresses in peace, with nibbles and a cocktail! If you are looking for a safe, healthy, chemical-free mattress for the whole family, try Naturepedic Organic Mattress Gallery. If you are looking for an affordable mattress, you really can’t go wrong with Mattress Firm Minneapolis Clearance- located in Northeast Minneapolis (1710 New Brighton Blvd.). At this location you will find great savings year-round and particularly during holidays like July 4th and Labor Day. When in Saint Paul, try Elsa’s House of Sleep (1441 University Ave W. Saint Paul). Here you will find great savings on not only mattresses but other furnishings for your home. Elsa’s offers mattresses for futons, and the whole-range of sizes including full, twin, queen,and king. Elsa’s is a full-service shop and will deliver and assemble. Have you ever wondered: where can I find a mattress store in Rochester, Minnesota? We were too, but after some searching we found that there are some great options if you know where to look. Rest Assured Mattress Company (4151 E. Frontage Rd. NW) is a mattress store that makes all of their mattresses on site. They offers a wide-range of products to match every budget and need. This is a local and family-owned mattress shop that was established nearly 30 years ago. If you are looking to purchase a mattress at a location that really understands their products and will not pressure you to purchase outside of your comfort zone, head to Rest Assured Mattress Company! Quality Woods (1431 Hwy 52 N.) is a great option if you need to purchase a mattress and furnish your home- you’ll find everything all in one location including Latex mattresses, Gel Memory Foam mattresses, Linked Coil, and Isolated Pocketed Coil mattresses. The wide selection includes all styles as well: from firm to ultra plush. If you are looking for quality mattresses and furniture offered at great prices, Quality Woods is a fantastic option. Land-O-Dreams (602 Broadway Ave.) has something for everyone: latex, air beds, futons, organic mattresses, hybrid mattresses, and more. We understand that purchasing a mattress can be daunting and confusing- Land-O-Dreams makes this important purchase simple and will listen to your needs. This mattress shop offers premium mattresses at great prices. Do you need a mattress in Duluth? Rest assured, we found you some great options. We examined a wide-range of mattress shops across the city and selected the ones that offered the full package: great products, friendly sales teams, delivery, and affordable. A mattress may be the most important purchase you make, and we understand that. Here are some of the best mattress shops in Duluth. Discount Mattress (711 E 4th St.) offers a wide selection of quality mattresses and furniture and no-pressure sales. You can find twin mattresses for as low as $59.99 right through the range. If you need financing, Discount Mattress has got you covered, and the quality customer service team will not pressure you to purchase. Sound too good to be true-they even deliver. If you need an affordable mattress, try Discount Mattress. Are you looking for a mattress near Duluth? Try Earth Exchange just over the state line in Superior, WI. Earth Exchange is actually a thrift store that sells new mattresses and new bedroom furniture. This is a great place to shop if you also love to look at curiosities, and have some spare time on your hands. The sales team are friendly as well. If you’re looking for a premium mattress try Schneiderman’s Furniture. Schneiderman’s Furniture (4725 Decker Rd.) is a Duluth staple that carries quality mattresses and other furniture for your home. They offers hybrid/foam, innerspring, luxury, and more. You can even purchase adjustable bases. If you are having back pain or other chronic pain or just can’t get a great night sleep you may need to check in Schneiderman’s for a mattress upgrade. A good night’s sleep is the foundation for a healthy happy life. As one might expect, mattress stores in Minnesota are not limited to the cities and regions tackled so far in our article. Quality mattress stores can be found throughout the state in cities and towns such as St. Cloud, Duluth, Bloomington, Mankato, Eagan, Burnsville, Eden Prairie, Maple Grove, Brainerd, Edina, Minnetonka, Bemidji, Stillwater, Winona, and others.